Are you going to be at the following veterinary CE conferences? If you ever need content or a guest. Keep us in mind. When is your backyard poultry webinar? trying to sign up. Thanks Andrew! It’ll be in February and we haven’t listed it yet! Sign up on the bottom left of our home page to subscribe to our email list and we’ll make sure to email when the poultry webinar comes out! Thanks for your enthusiasm – love it! Not this year, I’m afraid! Is it open to technicians, support staff? 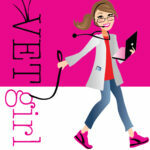 Are you planning on another Vetgirl conference in 2019? Any dates firmed up? Nope – 2020! Stay tuned! It’ll be in the Midwest!